In what is laughingly referred to as my ‘spare time’, I have developed an abiding interest in a Viennese Art Deco poster called Julius Klinger, of whom I have written before. A wonderfully talented and ironic graphic designer who was prolific in Germany during the 20’s and 30’s, Klinger had a style all his own. I discovered his work when I bought a portfolio of his works shortly after opening the gallery and fell in love with his refined style, his insightful designs, and graphic aesthetic. I have often said that he is the father of what is today called ‘branding’: his work for a tobacco company called Tabu included logos, billboards, internal and external communications, ads – in short, everything which the company needed to market and brand their items. In fact, I was so fascinated by Mr. Klinger that I decided to write a book about him (which is currently being edited, and which will, hopefully be published next year). 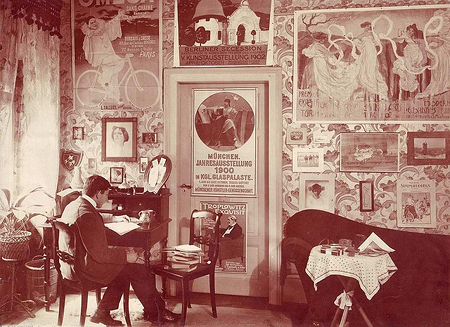 It was while writing the book that I discovered that Klinger’s posters were prominently featured in the collection of a Viennese poster fanatic named Hans Sachs. Sachs was a Jewish dentist, who amassed – between 1910-1937 – a poster collection with over 12,000 pieces. Mr. Sachs also published a magazine devoted to posters and poster artists, and single-handedly promoted the field of poster design in Germany and Austria. In 1937, the Nazis seized the Sachs collection and briefly interned Sachs in the Sachhausen concentration camp. He was subsequently released, and fled Germany with his wife, his infant son Peter, and a small roll of posters (including some by Toulouse Laturec) that he sold when he arrived in the United States. They were the only items he managed to leave with. It can be said that these posters quite literally saved his life. After the war, Hans Sachs applied to the Germany government for a compensation payment for his collection, which was presumed lost. He was awarded $50,000. 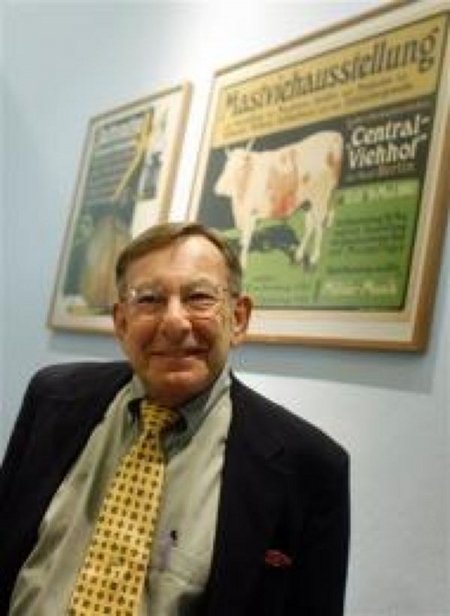 50 years later, Peter Sachs, now an older gentleman, realized that the poster collection – now numbering 4000 pieces (the other 8000 pieces having been destroyed, lost, or stolen) was housed, in its entirety in the Berlin Deutsches Historisches Museum. He petitioned the German government for the return of his father’s collection – conservatively valued at between $7-10 million dollars. Through years of legal battles and setbacks, Peter Sachs doggedly pursued his claim through every minor and major court in Germany. Finally, the German Supreme Court ruled that although the statute of limitation had expired, and although his father had received remuneration for the collection, to not return the collection to his son would be to continue the perpetration of Nazi crimes. “The first time I saw the photograph of your father – the one where he is sitting most elegantly at a desk in a room filled with posters – I smiled with a sense of recognition. I never heard from Peter Sachs. But about a month ago, I received a call from the auction house that has been tasked with selling the collection. Guernsey’s auction house in New York will devote three 3-day auctions over the course of the next 14 months to the sale of the Sachs collection. Peter Sach’s lawyers had forwarded my letter to Guernsey’s, and as a result of that, I was invited to help catalog and sort through the Hans Sachs collection, which arrived in New York last week. I am humbled, thrilled, and excited beyond measure. 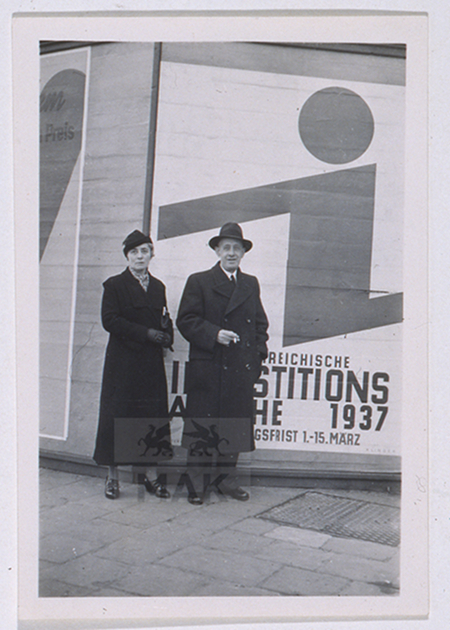 A very rare photograph of Julius Klinger and his wife Emily at the Hans Sachs Poster exhibition in Berlin 1937. Shortly after this photograph was taken, the exhibition was seized by the Nazis. I firmly believe that this is a once in a lifetime opportunity to see, and touch a collection that was lovingly put together almost a century ago. As a poster dealer and collector, I can not imagine any place, or any thing I would rather do. And for this opportunity, I have to thank Julius Klinger. I hope I do him proud, and hope as well that I can honor him, and Hans Sachs, with a exhibition and a book which gives them both the recognition that they deserve. Click here to find out more about the legal case regarding the Hans Sachs collection. Click here to read an article about the collection and its return.